The company has made its mark as a Manufacturer, Supplier & Exporter of Wooden Block Pallets, which are efficacious for the industrial product packaging. The Wooden Block Pallets have a greater production cost than Wooden Stringer Pallets, but they are known to be typically stronger. 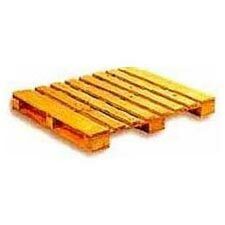 The sturdy design of the Wooden Block Pallets is complemented by its termite resistant nature. The basic construction of the Wooden Block Pallets is done with nine blocks placed at the four corners and that imparts strength.